The Northeast Basketmakers Guild (NBG) was founded in 1985 fulfilling a vision by two basket makers, John McGuire and Susi Nuss. The mission, then as now, is to further interest in basketmaking. At the time the NBG was founded, basketmaking was experiencing a “boom” in popularity. Membership grew steadily as many folks tried out the craft. The challenge has always been two-fold: to inform new basket makers of the organization’s existence and to provide experienced basket makers with what they need to stay involved. To accomplish the stated mission a group of five founding members decided to pursue members by establishing a mailing list. Printed newsletters were created to share upcoming basketmaking events, report on basketmaking events, feature basket makers and basketmaking techniques. Annual business meetings were held featuring guest speakers. Events were organized to provide members with opportunities to interact with other basket makers, share their craft with the public and learn more about their craft. Early events included Basket Days where basket makers gathered to sell their baskets and educate the public about basket making and Basket Exhibits where members were invited to display their baskets for public viewing. The NBG Summer Retreat began in 1991. It is an event that has continued annually. It always has been held at Sunrise Park in Suffield, Connecticut. This location was initially selected for its central location for the membership and has remained popular because of its beautiful natural setting overlooking a picturesque wooded lake. Activities have included demonstrations, tailgate sales, auctions, and pot luck luncheons, but the core activity is basketmaking classes. The NBG Gathering was begun in 2000. The event initially was a biannual event, but because of interest, it became an annual event. At this three-day conference, basket makers may take classes with instructors who travel to the event from around the country. The Gathering has been held at residential sites in centrally located Suffield, Connecticut; West Springfield, Massachusetts; and Enfield, Connecticut. Attendees may stay on site or travel to the event daily. Meals are available for purchase. 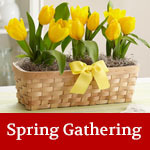 Many activities are featured at the Gathering, including demonstrations, speakers, raffles, and a NBG annual meeting. 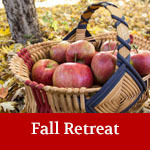 The NBG Fall Retreat is an event that after a few attempts in various locations over the years, in 2015, established a following in southern NH. 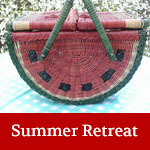 This event features several full-day basketmaking classes. Scholarships were established in honor of the founding members to encourage and facilitate members’ educational pursuits. The scholarships are awarded annually at the discretion of the NBG Board. As technology has grown NBG has adapted to the changes in communication by creating a Website and transitioning the newsletter from print to electronic form. NBG was incorporated in the state of Connecticut in 2004. Throughout NBG’s history, the Guild has had hundreds of members with the annual membership tallying between two and four hundred.